Tudor Hall, 7th floor, King George ll Palace Hotel, 3 Vassilis Georgiou A' Street, Athens 10564. 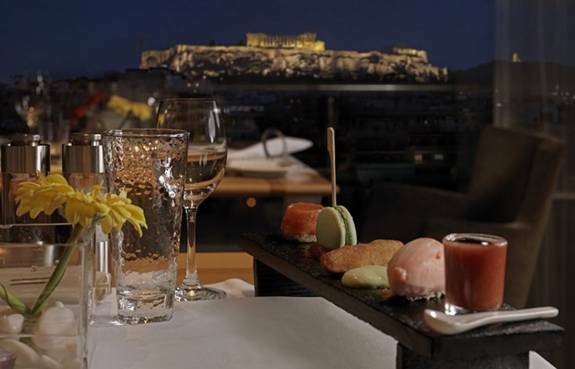 +30 210 322 2210 This magnificent restaurant has an enviable panoramic view of Athens. Looks out at the Acropolis and boasts a Greco-French menu. At Syntagma square. Open 12.30 pm to 16.30 pm for lunch, 7 pm to 12.30 am for dinner. Socrates, Divani Palace Acropolis, 19-25 Parthenonos, Athens 11742. (National Gallery area). +30 210 928 0100. Beautiful Athens & Acropolis nighttime views. summer months. Next to the New Acropolis Museum featuring a magnificent view of the Sacred Rock accompanied by the divine cuisine and extensive variety of cocktails. Rooftop Garden Cafe, Adonis Hotel, 3 Kodrou & Vouls Streets, Plaka, Athens 10558. +30 210 324 9737. View of Acropolis. 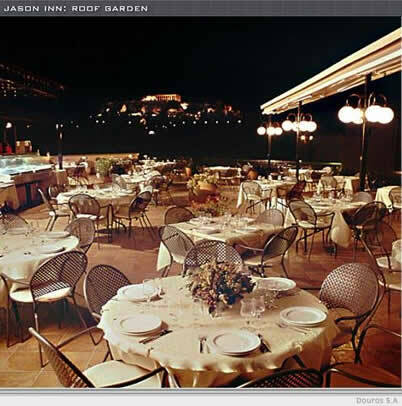 Roof Garden Restaurant, Jason Inn, 12 Agion Asomaton, Psirri, Thission, Athens 10553. Beautiful view of Acropolis. May to October. Air Lounge Roof Bar, 9th floor, Fresh Hotel, 26 Sophokleous & 2 Kleisthenous Street, Downtown Athens 10522. +30 210 524 8511. Up on the ninth floor and open to the sky, Air Lounge spreads over several levels and is dotted with uplit olive trees. It’s the hotel’s bar groovy social centrepiece, and is as popular with locals as guests – largely for the incredible skyline views and it’s these sweeping cityscape and Acropolis views from the rooftop bar that truly set it apart. From May til October. Metro Omonia. Open summer months, until 1.30 am. Notos Galleries rooftop cafe, Kotzia square (where the Town Hall is). A big department store. cafe on the top floor. Acropolis view. Olive Garden, Hotel Titania Athens, 52 Panepistimiou, Athens 10678. +30 210 332 6000. Beautiful Views of Acropolis. Just off Omonia Square. +30 210 383 8511. Roof Garden BBQ Grill, Tony's Hotel, 26 Zacharitsa, Koukaki, 11741. +30 210 923 6370. Strofi, 25 Rovertou Galli, Acropolis, Athens 11742. +30 210 921 4130 Located amidst stunning scenery under the sacred rock of the Acropolis, just a few steps away from the Odeon of Herodes Atticus. 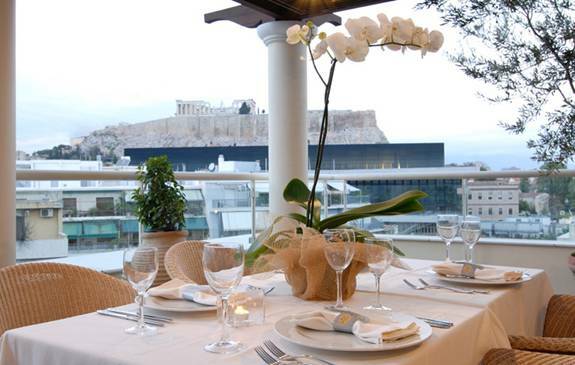 Dine on the roof top with the view of the Acropolis. Roof Garden, Acropolis View Hotel, 10 Webster St., and Robertou Galli, Athens 11742. Terrace. 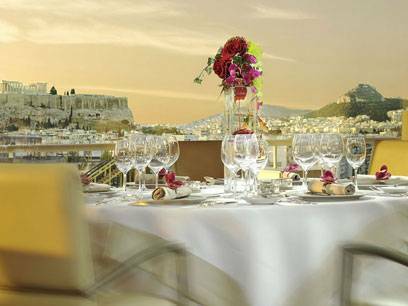 Rooftop Restaurant, 7th floor, Athens Gate Hotel, 10 Syngrou Avenue, Athens 11742. +30 210 9238 3023. Reservation. The view from the rooftop restaurant of that hotel is a perfect view of the Acropolis. The hotel is in the perfect location - directly between the Temple of Olympian Zeus and the Acropolis. Peacock Roof Garden Restaurant, Hera Hotel, 9 Falirou, Athens 11742. +30 210 923 6682. Magnificient Setting, Acropolis View. Rooftop restaurant, spectacular. Ioannis Restaurant, Royal Olympic Hotel, 28-34 Athanasiou Diakou St, Athens 11743. Gourmet Restaurant at the Roof Garden. Acropolis Station. Premiere Restaurant, Athenaeum InterContinental, 89-93 Syngrou Ave, Athens 11745. +30 210 920 6000. Enjoy floodlit views of the Acropolis. Closed Sun and Mon. Premiere Rooftop Bar, 8th floor, Athenaeum InterContinental, 89-93 Syngrou Ave, Athens 11745. +30 210 920 6000 Lounge bar and grill. Allows you to enjoy complimentary cocktails as you watch the sun set over the Acropolis. 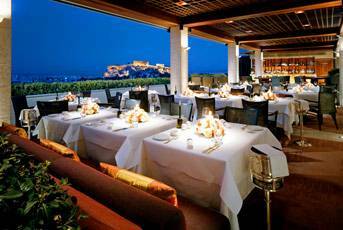 Later, enjoy floodlit views of this center of ancient Greece from the hotel's Rooftop Premier Restaurant. Summer 8pm-1am. Tel: 210-920 6981. 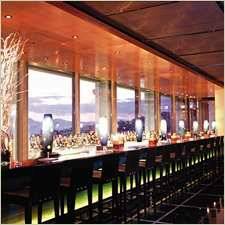 Panorama Roof Top Pool Bar, Athens Ledra Marriott Hotel, 115 Syngrou Avenue, Athens 11745. +30 210 930 0000. Summer bar featuring snacks, drinks and a stunning view of the Acropolis by the rooftop pool. Open for lunch and dinner during summer. Dress code: Casual. +30 210 930 0177. Filistron Rooftop Terrace, Apostolou Pavlou 23 (opposite Thissio). +30 210 346 7554; +30 210 342 2897. 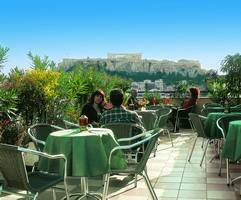 The "Filistron" rooftop, with its traditional appetisers and "old Athens" café atmosphere. Marabu Bar, 113 Panormou Street, Ambelokipi, Athens 84200. +30 210 691 0797. "Marabu", where spontaneous rock parties take place every night. 45 Moires, Voutadon Street & 19 Iachou Street, Gazi, Athens. +30 210 347 2729. The legendary rock club in Gazi. Mayo, 33 Persefonis St, Gazi, Athens. +30 210 342 3066. Daily 8pm-4am. Gayish. Great rooftop views. Micraasia, 70 Konstantinopoleos St, Gazi, Athens. +30 210 346 4851. Daily 7.30pm-4am. Bios, 84 Pireos Street, Athens. +30 210 342 5335. Arty. Closest Metro Station: Kerameikos, Line 3. " Bios " rooftop on Pireos Street has been popular since last summer. It is one of the alternative haunts in the city, drawing many of Greece's up-and-coming artists and musical producers. Theliseis, (Desires), 3 Iakhou, Gazi, Athens. (Iakhou 3, Gazi). Meson El Mirador, 88 Agisilaou St, Athens 10435. +30 210 342 0007. Mexican specialties. Daily from 5.30pm. Sundays from 1pm. To Spiti tou k.pil poul, Pavlou & Poulopoulou St, Thissio, Athens. +30 210 345 0803. 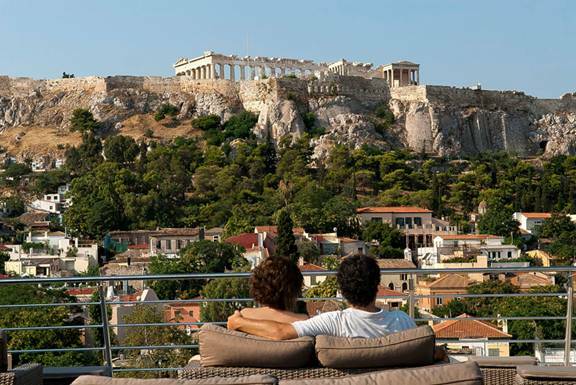 One of the most beautiful rooftops with great views of the Acropolis.